In contrast to last week, this has been quite the productive week. We did end up skipping the out of town field trip to Hannibal, Missouri to visit Mark Twain's home. 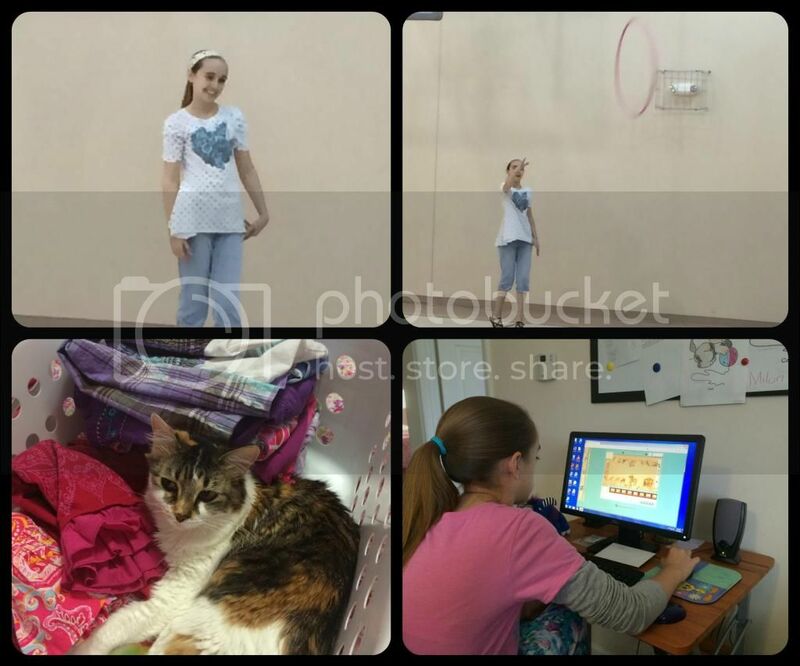 The pictures from our homeschool group field trip looked like they had a lot of fun, but by Sunday afternoon even Amber was in agreement that we needed to have a recovery day on Monday instead of a field trip. Since Fred had already planned to take a day off we made it a low-key family day, complete with a quick trip to the outlet mall for Disney store shopping and so that Fred and I could acquire pieces to our Halloween costumes. The adults do not normally dress up for Halloween in our family, but since Amber is Pinkie Pie this year and Fred does a perfect imitation of Big Macintosh, we decided that he could dress up like a pony too. Then since it's pretty easy to do an Applejack costume, I was elected to stay home and hand out candy dressed as Applejack. We are basically just wearing denim and plaid shirts. (LEFT) Posing with the project from my co-op class for this week. 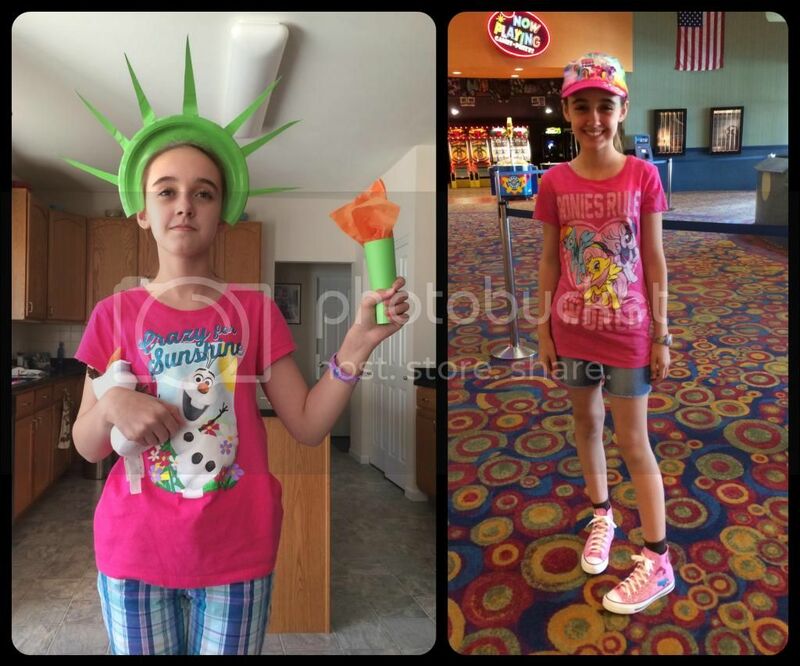 Amber learned more than she knew about the Statue of Liberty just helping me with the project. (RIGHT) Waiting to see the MLP Equestria Girls: Rainbow Rocks movie with friends. Notice the Pinkie Pie shoes? Amber completed full days of school on Tuesday and Wednesday this week. I don't mean she had school all day, but she completed all the scheduled subjects each day - including math! If I could simply keep her schedule from being too busy she would be rested enough to have more days like those. With that goal in mind I've already opted out of two homeschool events that we had originally been tentatively signed up to attend. I'm also moving one of my own appointments to coincide better with Amber's next break week. We can't really be choosy about when Amber see the neuroscience doctor, but most others we can limit to our break weeks. Thursday was our usual co-op classes day and then foster parent class for Fred and me. Amber started out the day already exhausted and it went down hill from there. Thankfully my mom is the one who watches Amber while we are in class. She had so much experience caring for my dad all those years that she makes the perfect helper with Amber. I'd be lost without my mom. Today has been another recovery day for Amber. I'm in the process of adjusting our planned school schedule to reflect that most Fridays will be a recovery day of some type due to co-op and foster classes. After our evening classes complete I'm hoping that Amber has an easier time on Thursdays, but they will still be arduous for her. We have weighed the pros and cons of attending co-op and every time the benefits far out weigh the exhaustion it causes. (TOP) Playing toss the hula-hoop during a break at co-op. I can't get this child to be restful, ever. Even though it's been a recovery day, Amber has listened to several renditions of Beowulf in Old English, watched her CNN student news and worked on several projects associated with the Bayeux Tapestry. We've been studying William the Conqueror and the Battle of Hastings recently. This has probably been Amber's single most favorite topic of study in history since we began homeschooling two and a half years ago. I think her interest has as much to do with the balance of learning projects as the topic. She started off reading the selections from our history books: a two page spread in the Kingfisher History Encyclopedia, several chapters in The Story of the English, Our Island Story, and The Story of England. Also the chapter on William the Conqueror from Famous Men of the Middle Ages. 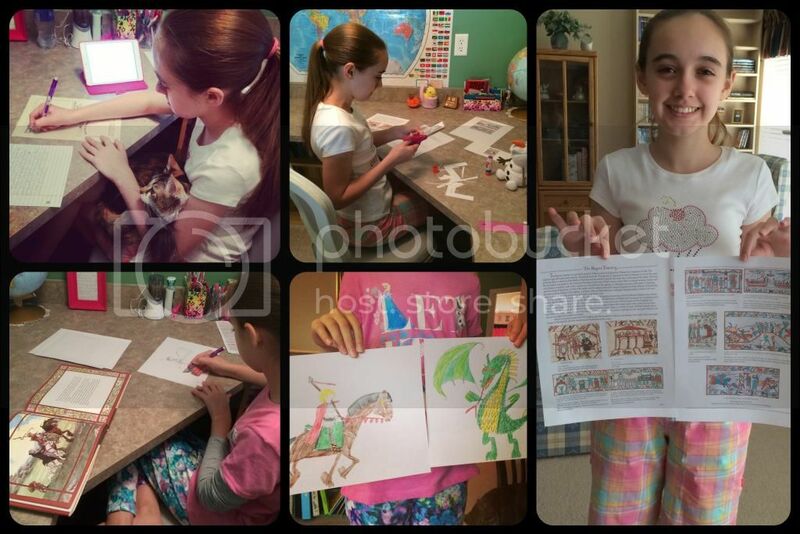 She was also assigned to read the illustrated book Saint George and the Dragon for a project. We listened to the audio tour of the Battle of Hastings from Homeschool In the Woods' Middle Ages and Amber mapped the Normal conquests using Map Trek. Amber read information on a website about the Bayeux Tapestry and spent hours designing her own Bayeux Tapestry using their interactive activities. She wrote a newspaper article on William the Conqueror for her ongoing Middle Ages Times project, as well as writing a short biography of William. Finally, Amber selected scenes from Saint George and the Dragon to include on her own tapestry. She's been working today on drawing the scenes on paper and coloring them in. Later, we will modge podge all the scenes on our burlap strip. (LEFT-TOP) Writing for the Middle Ages Times; (Middle-TOP) Working on assembling a Bayeux Tapestry project; (RIGHT) Finished Bayeux Tapestry project. (LEFT-BOTTOM) Sketching designs for a Saint George tapestry; (Middle-Bottom) A couple of finished drawings for Saint George. While some of our reading selections and projects were researched and selected by me, the majority came from Tapestry of Grace. We are still in love with this curriculum. It provides us with the foundation for a classical education with a multitude of options that makes it adaptable for Amber's needs and abilities. I must say though, if you use Tapestry of Grace but do not checkout the supporting links for each unit, then you are really missing out on a great deal of the support provided by TOG. This weekend I'm going to finish the complete overhaul of Amber's closet that I started Wednesday evening. The poor girl can't find anything in her closet right now. Even though she has a rather large walk in closet, it wasn't working for her anymore. I had set up the shelving to fit little girl clothes and it no longer worked for almost teenager clothes. Now I need to install different shelving and re-arrange all the clothes in Amber's closet and her drawers. What an awesome week! I am so glad you were able to get so much done. Isn't it great having a week off for extra doctor appointments. We can't postpone all of them either, but delay the ones we can for break week. I glad to hear that you have had a productive week. I need to go through the kids clothing. Margaret is claiming that she only has three pairs of pants. While that is possible I rather doubt it. Still there might be some shopping in our future. I have no idea who Pinkie Pie & the rest are! I guess I am missing out on something else. TV? Do you watch the CNN Student News on-line? I should check that out! I think I have read a few of our homeschooling Moms doing this with their kids with success. She does accomplish quite a bit of stuff in a week! Happy weekend! A lovely week. I'm so glad project based learning is working out so well for Amber. You don't want to come over to me and go through my children's wardrobes and sort them out do you??! I can't wait to see pictures of the Halloween costumes!! Keilee just loves CNN Student News. She is forever telling me things that I had no clue about since we don't watch regular news! I changed out my summer clothes with winter ones yesterday and Keilee has still got to do hers. It takes her hours so good luck with that! Happy weekend Christy. I think you guys accomplished a lot this week despite needing those recovery days! I have been noticing that Amber is looking more grown up in your photos lately. I do not envy you the closet project!